A 64-year-old woman was admitted to the hospital with a 3-month history of headache and a 1-week history of sudden decreased vision in the right eye. Before admission, the patient began to have headaches on the right side, persistent sharp pain and nasal obstruction. 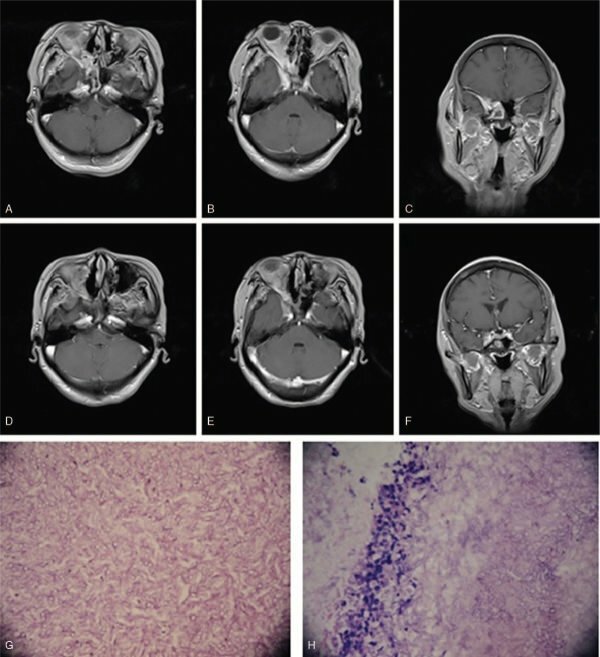 The diagnosis of rhinosinusitis was considered before hospital admission, and right sphenoidotomy and partial right upper turbinectomy were performed but never completely resolved her symptoms. One week before admission, the patient experienced sudden blindness in her right eye, and the pain intensified. She had a history of poorly controlled diabetes mellitus. The clinical examination indicated right periorbital cephalalgia, right trigeminal neuralgia and right ophthalmoplegia. Axial and sagittal T1 contrast-enhanced magnetic resonance imaging (MRI) showed a right orbital apex mass abutting the right maxillary sinus, posterior ethmoid sinus, sphenoid sinus, and cavernous sinus. A cerebrospinal fluid (CSF) analysis revealed elevated protein levels (0.81 g/L); however, no infectious agent was found. Routine blood tests, CSF tests and IgG and IgM tests were negative. Tests for the tuberculosis antibody, HIV, fungal D-glucan, and procalcitonin were all negative. Members of the Otorhinolaryngology and Ophthalmology Departments were consulted, and functional endoscopic sinus surgery was performed. Upon debridement of the anterior face of the sphenoid sinus, it was discovered to be filled with a light tan substance with a consistency similar to that of peanut butter. The inflamed tissue was sent to the pathology laboratory for identification. The pathology results showed septate hyphae branching at right angles, which was highly suggestive of aspergillus. The patient was prescribed systemic voriconazole and intravenous heparin postoperatively. Her condition improved significantly, with complete resolution of headaches, and she was discharged on daily warfarin with a goal INR of 2–3. She also received 4 months of voriconazole treatment (200 mg twice daily). At the latest follow-up, 4 months after surgery, the patient was clinically stable, and their extraocular movement had continued to improve but with persistent poor visual acuity of her right eye and no light perception. A follow-up MRI scan 4 months after surgery showed improvement of the inflammation in the right orbital apex and cavernous sinus. No signs of recurrence of the disease were present.